When is a slice of life not a slice of life? When it’s filmed. On the surface, “Blacksmith Scene” seems to be exactly that – the documentation of an actual event, some raw footage of a real activity. 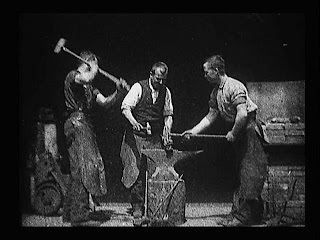 Three men work a heated piece of metal with sledgehammers, shaping it into usable form. They stop for a moment to reheat the metal, and pass around a bottle of beer in the interim, each taking a swig. Then they resume work as the film snippet ends. However, the event is staged inside Edison’s Black Maria film studio. The men on screen are not blacksmiths, and they are arranged symmetrically around the anvil in the center of the screen for maximum viewing advantage. The men work with rhythmic precision, alternating blows smoothly. Someone came up with the “beer break” gag – already the desire for some kind of modulation in the action, even on a 30-second reel, is there. Interestingly, the men appear quite aware of how little time they have to pull the break off – the last man of the three barely touches the bottle to his lips before hastily setting it down to resume the action before the film runs out in the camera. Only two of the participants have been identified – Edison employees Charles Kayser and John Ott. Were these men the first American film actors, not in the sense that they were stage or athletic performers flaunting their talents before the camera but people pretending to be other than they were? Oddly, most of the versions of this film available on the Internet descend from a filmed projection of an original print, not from the original negative. Whoever shot a copy of the film in this version can be seen in the first few seconds, his silhouette overshadowing part of the action on the left side of the screen. Already a postmodern touch to film study. The film remains significant as it raises a mundane task to a level of a marvel to be witnessed simply by virtue of its being recorded. Ironically, in less than two decades, the action depicted would no longer be a commonplace of American life, and the work we watch is now strange to us, inscrutable, ancient. Electrochemical life records the end of the hand-hewn era.